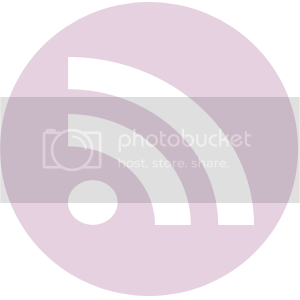 This weeks post comes out of necessity! 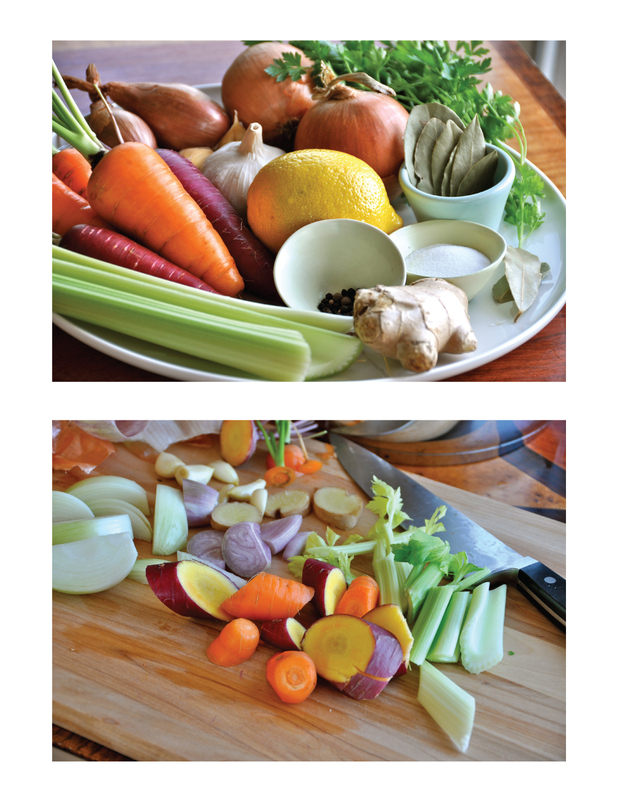 The FoodBuzz Challenge #4 is to use photography to create a step-by-step, instructional tutorial. I was all set to make a gorgeous fruit tart when luck would have it, I got a cold (I never get sick)! So I did what my mom would do and made a healthy chicken soup. She always says chicken soup makes you feel better. Whether or not this is scientifically true, it always seems to do the trick. In addition, it's so easy to make and tastes wonderful. 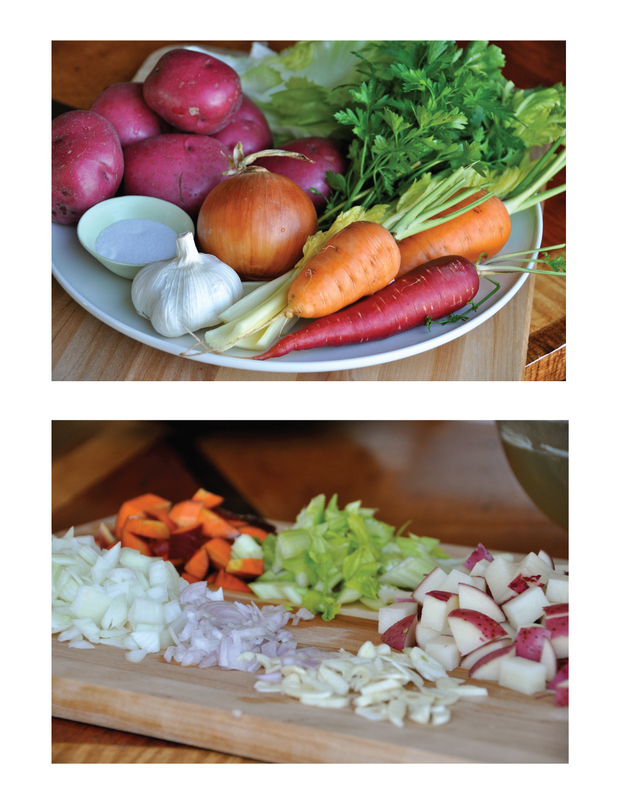 It also gave me an opportunity to use some gorgeous carrots and herbs from my garden. By the time I made this post live, the soup had done its trick and got me back to feeling great! 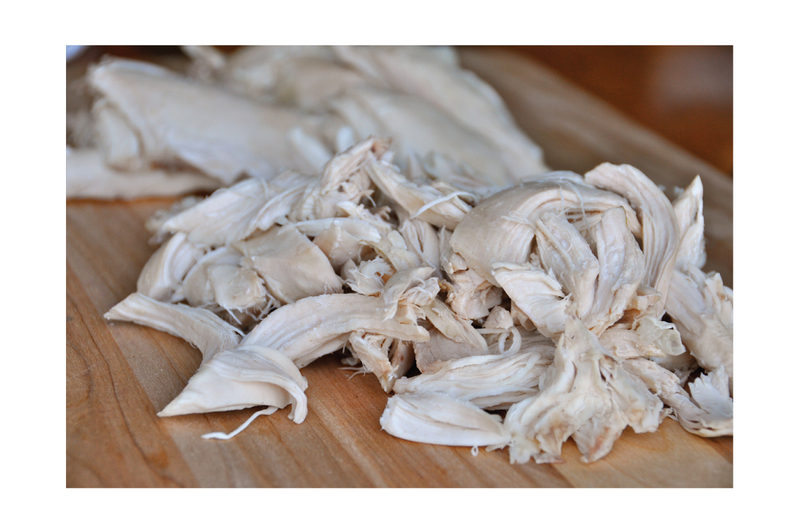 The following Chicken Soup recipe will make roughly 8 hearty bowls. Leftovers freeze great and taste better the next day! 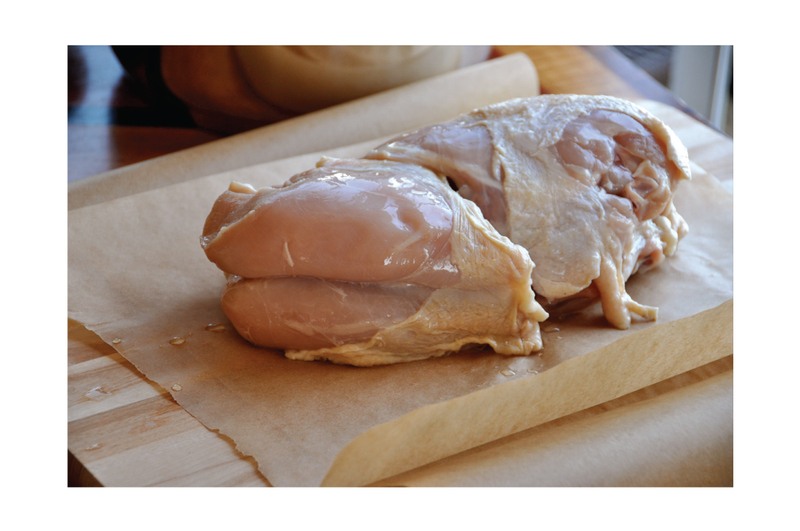 Leave the skin on and bones in – these add flavor! 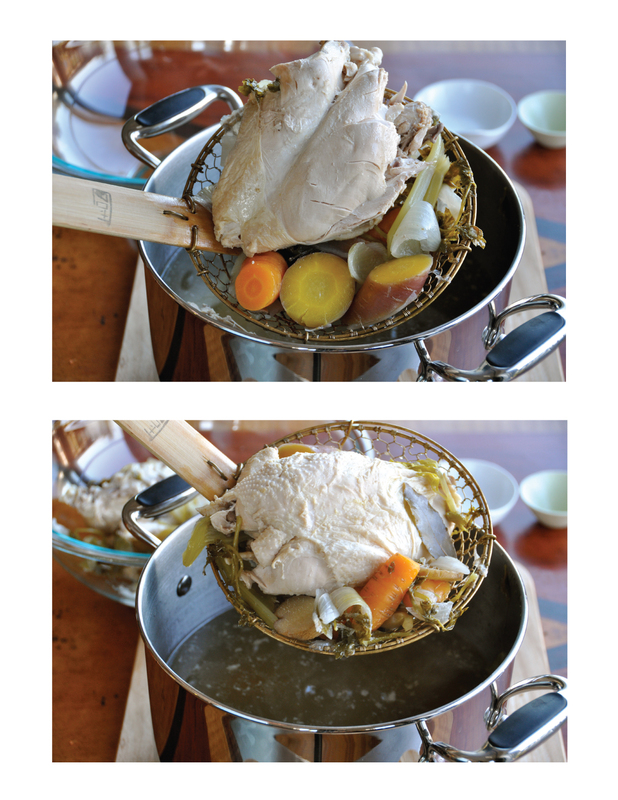 Your beautiful chicken stock is finished and ready for soup! Serve soup over your choice of noodles or rice (I used egg noodles). Sprinkle with freshly chopped parsley and serve with a hearty bread!! I know not everyone adds potatoes to their chicken soup, but I was craving something a little more hearty. The lemon and ginger make the broth beautifully fragrant. Also, the soup can be served the same day the stock is made. I like making the stock a day before making the soup because it makes the soup much more flavorful. 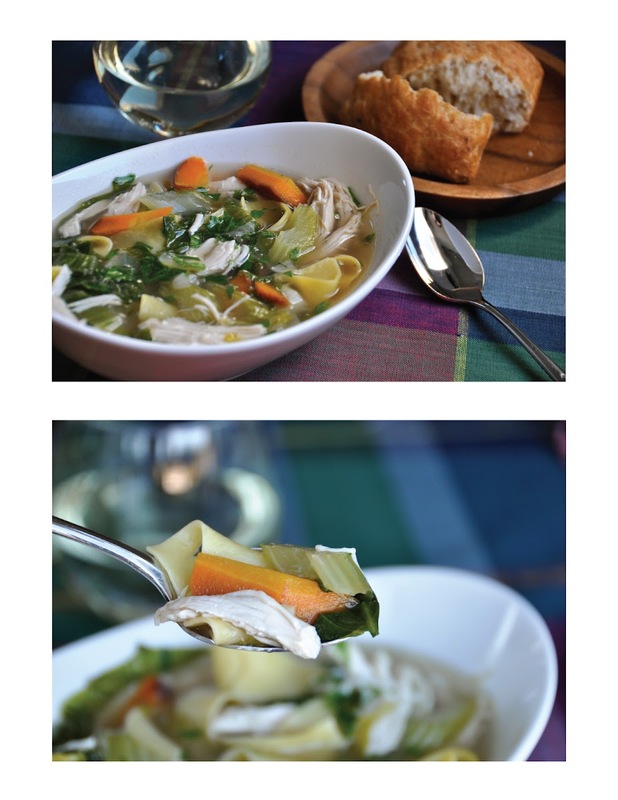 I hope you've enjoyed reading about my therapeutic chicken soup! 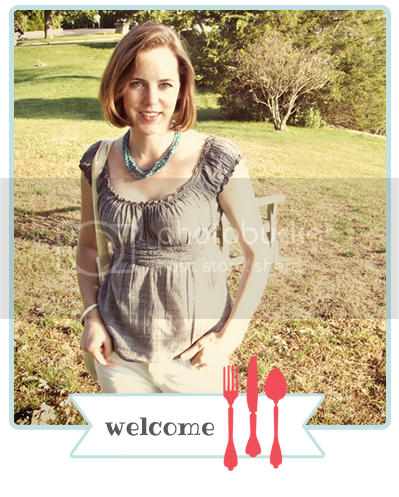 If you like my FoodBuzz Blogger Challenge posts please vote to keep me in the competition & also feel free to comment! I love reading your thoughts and suggestions. Simple but so lovely. One of the lovelier posts I have seen for this challenge. Good Luck! Ah, the weather these days are unpredictable...a lot of friends I know are getting colds, too. I hope you feel better! The chicken soup looks lovely...I'll bet you'll be up and running in no time! Such vibrant photos! I love making chicken soup this way, especially in the winter when it fogs up your kitchen windows. It makes the house so welcoming and cozy. Thanks for the visit and a boomerang vote is coming your way. This looks delicious and so comforting. I love it. I hope you move on, just voted! you can't go wrong with chicken soup! There just isn't any store-bought substitutions!!! your soup looks so lovely and comforting. great entry - you have my vote! hope you feel better! that soup looks great for the sick or healthy! Mmmm, this looks so good and comforting!! Hope your cold is better! I love chicken soup, there is nothing better to warm the body and soul. 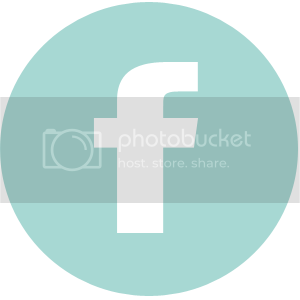 Your pictures are great! You have my vote! Nothing better than homemade chick soup - I think I will attempt to make some myself this fall! Nicely done. Probably a good choice over the tart, since you were sick. Gave you a vote! Thanks for all the comments!! I am feeling a million times better (I think the soup had something to do with it!)!! Love this post - definitely voted for you. 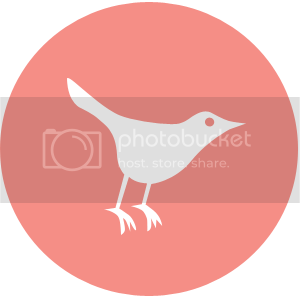 :) Awesome pictures with a clear layout & precise directions, perfection! Good luck! My god, these photos look absolutely phenomenal. May I ask what kind of lens you used? I can not wait to peruse through your blog. Living in Germany, will have to use my 'special' site to see! And you of course have my vote. You made this so user-friendly. This looks divine - you have my vote! That chicken soup really does look like the best! Your chicken soup looks so amazing and so delicious. I haven't made homemade chicken soup in ages and your step by step instructions and pictures are so helpful! Best of luck to you! 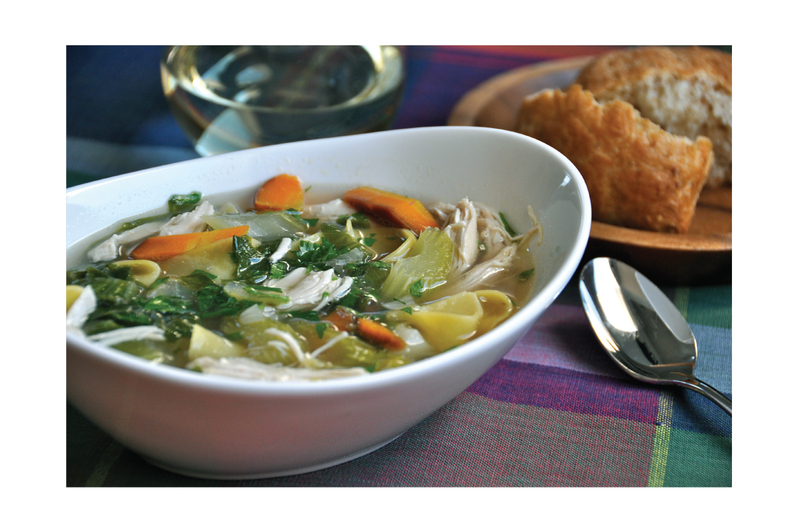 Your chicken soup is definitely picture perfect! Those vibrant vegetables looks so good!! Best of luck to you! I'm loving the colors in your pictures! So vibrant! And such a nice tutorial for such a classic dish that many of us don't take the time to make ourselves any more! Good luck in round 4! This is the ultimate comfort dish, but I've never had it with ginger. The next time I get a cold, I'm going to give this a whirl. Good luck this week, voting for you! Chicken soup is the ultimate comfort food. there is nothing better than a big steaming bowl to warm you up from the inside. Yours looks incredible. Your photos are lovely as always, and the steps are really clear and easy to follow. Nicely done. I voted for you yet again! Nice job. I love chicken soup. Just looking at that vibrant bowl of soup would make anyone feel better. Glad that it did the trick for you! 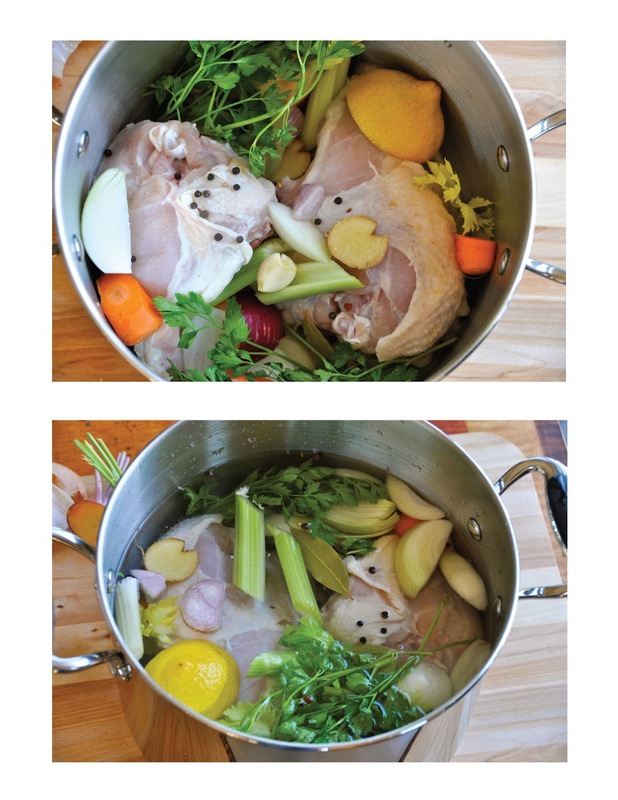 I know what i'm going to be doing this weekend - after reading and seeing this awesome chicken soup. Can't wait to smell it simmering and then to enjoy. Chris is a lucky guy. I am actually making this soup! I have done the broth but is about to do the veggies. You forgot to include in your steps to add some oil (I don't know what you use but I put some olive oil so the veggies won't burn) when you saute the veggies for the soup. Also you mentioned to add garlic along with the shallots to be sauteed but you didn't include how many cloves of garlic so I had to assume to add few cloves.